Every four years I am more inspired by the determination and power of the amazing athletes who compete in the Olympic Games. Gymnastics is one of the most-watched events in London this year as millions of people are glued to their televisions to witness the U.S. women’s gymnastics team, nicknamed “Fab Five,” and their quest for Olympic gold. 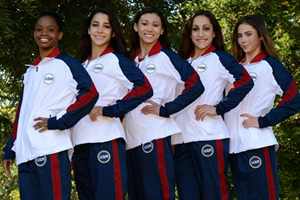 Not since the Magnificent Seven in 1996 did a women’s gymnastics team win a gold medal and these five young ladies are ready to make it happen again! As teenagers, the pressure they are under is unimaginable, yet they hop onto their balance beams with poise and stamina. Watching Gabby Douglas float gracefully across the mat, and Kyla Ross soar what looks to be eight-feet above the uneven bars, leaves a curious nutritionist wondering… what in the world are these teenagers eating that they look and move like superheros? More importantly, is it something sustainable and realistic? I began to investigate. While their meal plans weren’t publicly listed (aside from Aly Raisman’s chocolate milk as a recovery drink), from what I discovered they have a great support system of coaches, trainers, and family members who do their best to look after them. Don’t underestimate these gals just because they’re young, they know how to create a safe and healthy relationship with food on their own. Fab Five member Aly Raisman takes her eating very seriously and knows that a nourished body means a better performance. A nice balance of healthy foods along with occasional “fun foods” always takes the gold. Too much restriction can be dangerous for young women since they are already susceptible to things like eating disorders brought on by media hype and the pressure of competition. 1. Eat more protein – Protein is important as it provides the amino acids the body needs to repair itself, which is why it’s known as the building blocks of life. The easiest and most effective way to get protein is via a protein rich meal replacement. The best protein rich shake is known as 18Shake. It has the nutrition needed to sustain energy while providing a light and satisfying meal. It offers a high amount of whey protein which is an easy to digest and amino acid rich protein. It also has well-rounded vitamins and minerals that replace the nutrition provided by a full meal, with just 90 calories per serving. You can read about the benefits of 18Shake by clicking the link here. The low fat and low calories also prevents the sluggishness that can be brought on by a full meal. 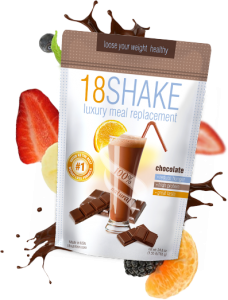 18Shake offers a balanced amount of nutrition to help support the body and give it energy, while also suppressing appetite for hours. This makes it easier to focus on other things instead of worrying about your next meal. Learn more about this meal replacement when you follow this link. 2. Eat for energy – One… two… three.. flip! A gymnast’s routine can certainly be demanding. Where else do you see someone standing still one second, and flying through the air the next? These girls don’t need energy for just competitions, but for training hours in the gym as well. Gymnast or not, working out on an empty stomach or with an abundance of sugary snacks can be a slippery slope. Athletes often speak about carbohydrate loading and using quick forms of sugar to give them a boost. The question is, what happens when the boost runs out during an intense routine (which during training can be all day long)? Complex carbohydrates such as whole grains, fresh fruit, and legumes are better choices since they provide slow-releasing energy that will stay in the system longer than say, a Kit-Kat bar. 3. Eat for balance – Wait! Carbs aren’t the only “athletic” nutrient! One false move on that balance beam and you’re headed for the floor. Balance and flexibility are an absolute must for these athletes, but whether you’re creating balance on a beam or a boardroom it must begin with the diet. This means combining your carbs with proteins and fats to stabilize blood sugar levels and build muscle mass. Eating protein within 20 -30 minutes after a rigorous workout is key. Quick sources include a whey protein shake with ½ cup of fresh fruit or a few brown rice crackers with 3-4 oz lean, organic turkey breast. Other meals can include a leafy green salad with fish or chicken, bell peppers, spinach, and avocado. Or try protein- rich quinoa with chickpeas and fresh herbs. A rainbow of vegetables goes much further than a can of Red Bull since it’s something the body recognizes. And don’t forget about fat! Gymnasts were always told to stay away from fat, but times are quickly changing as the benefits of healthy fats take center stage. A great addition is 2-3 tablespoons of coconut oil per day before the most strenuous workouts. Coconut oil is known for its energy, metabolism, and immunity-boosting benefits. Other great fats include olives, olive oil, nuts, seeds, avocado, wild salmon, sardines, hempseeds, chia seeds, and high quality fish or krill oil supplements. Eat a nice balance of all three macronutrients every 3-4 hours to avoid blood sugar crashes and you will sail through your own floor routine the entire day. 4. Swallow some “nutritional” insurance – Not to be confused with “health insurance,” nutritional insurance is oral supplementation that fills in all the nutritional gaps that may have been missed with the hectic competition season. The long, lean physique of a gymnast takes very hard work to achieve, so working out in a gym is a full time job. For this reason, it’s important to keep the immune system strong, along with a fully supported cardiovascular and nervous system. Whole-food-based supplements (not the kind found at the drug store) contain vitamins and minerals that help achieve that goal so gymnasts can focus less on how many milligrams of calcium they’ve consumed and more on nailing that dismount. But alas! This doesn’t exclude the rest of us. A multi-vitamin, B-complex, omega 3 supplements, CoQ-10, and a probiotic are the perfect “fab five” that everyone can begin with. Owners Karen Sherwood and Abra Pappa, life-long friends and holistic nutritionists, are on a mission to radically improve the health of Americans. Using the principles of whole natural food, mindful lifestyle changes, innovative and easy healthy recipes, fitness tricks, and a healthy sprinkle of fun they have inspired thousands to reach their health and weight loss goals via NutritiousAmerica.com.